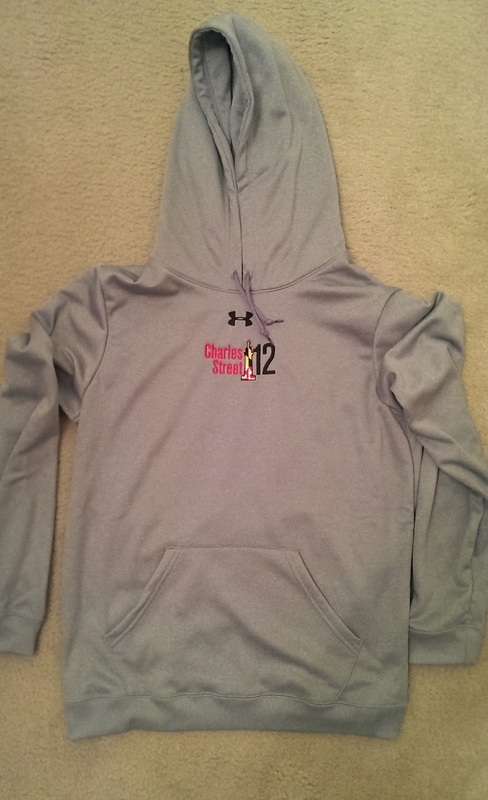 Saturday was the inaugural Charles Street 12- "Maryland's Most Monumental Race." 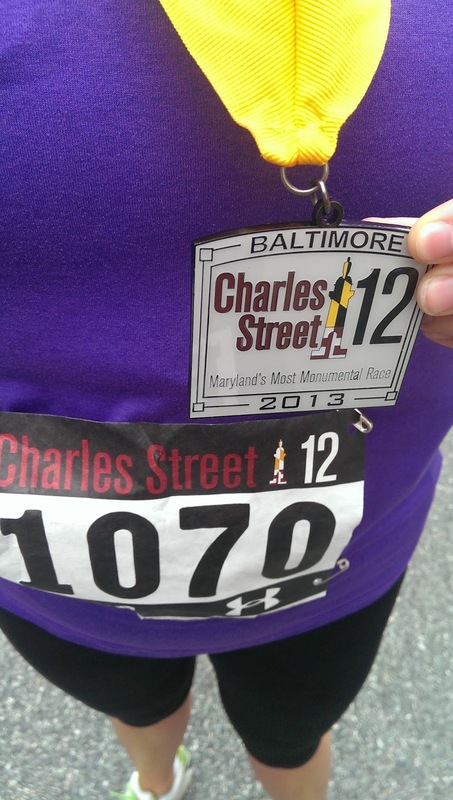 The course followed Baltimore's historic Charles Street from Towson to the inner harbor. 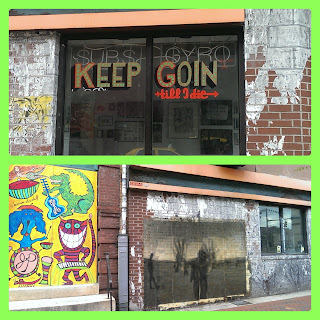 It promised to be mostly downhill and wind through some of Baltimore's beautiful neighborhoods. I was really excited about this race for two reasons- it was downhill and it was the inaugural event. Because I'm no longer a Baltimorean (recently moved a few hours away), I had a friend pick up our packets at a local running store, Charm City Run. In an Under Armour draw string bag, we got our premium (which was awesome! ), bibs, and timing chip. 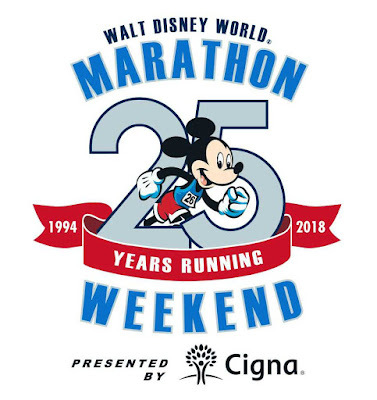 Because this race was a point-to-point (park at the finish and shuttle to the start), there would be on-site packet pick up but no bag check- at least that's what I was told when I emailed the race organizers. We drove to the finish line in downtown Baltimore, parked the car, and were on the shuttle bus to the start by 5:30 am. The start line was in the parking lot of a shopping center. There was a DJ, on-site packet pick-up, bag check, about 10 port-a-potties, and a few vendors in the parking lot. With an hour and a half to kill, Matthew and I found a curb and people watched. I was a little ticked because there WAS a bag check and we would have been able to do on-site pick up and bag check- but at that point it didn't matter. I used the bathroom around 6:30 and then started to do some stretches. I'm glad I didn't wait any longer because the line for the port-a-potties became ridiculous pretty quickly. With almost 2,000 runners and 10 bathrooms, it was a recipe for incredible lines. The bathroom line that wrapped around the parking lot- the port-a-potties are on the left. At 7:30 am, we were off! 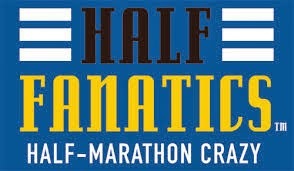 While this race advertised being downhill, the first 4 miles were chock-full of rolling hills. It was already around 75 degrees and incredibly humid. 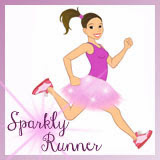 Our plan was to run 13:30 pace for the first 4 miles, 12:30 for the next 4, then 11:30 for the last 4 miles. Well, I was super excited and ran the first 4 miles between 12:18 and 12:45. 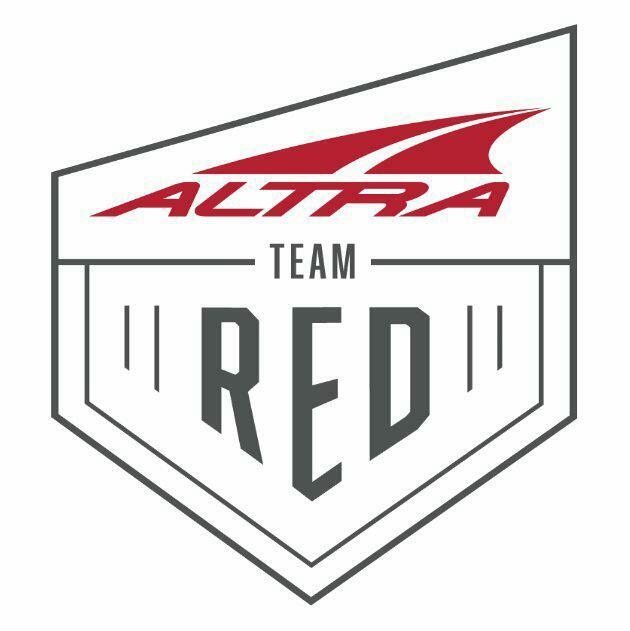 Which was cool, but I seriously need to pump the brakes for the next distance race. 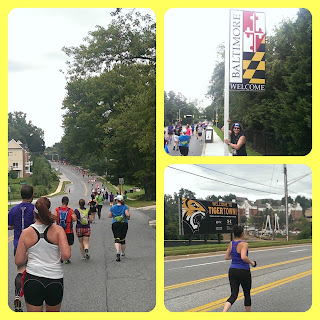 This part of the race also had very cool scenery- we ran past Towson University and crossed the county/city line. Yup, that's not a downhill. These miles flew by. Around mile 6, we could see the city and since we were ending downtown, I knew we were getting close. Also at mile 6 was a single port-a-potty. One. For almost 2,000 runners. This was the only bathroom we'd see on the entire course. There was a line about 15 runners long. Matthew and I decided to seek refuge in the shrubs and trees just beyond the port-a-potty. This was the day I became a "real" runner- peeing in the bushes on a race course. Graffiti that I thought was picture-worthy. Here's where the course got a bit tricky. We were downtown in Saturday traffic and there were a lot of ticked off motorists. Most of the course was on Charles Street- which is a four-lane road. They blocked off one lane for the runners. While there was incredible police presence- some on motorcycles followed us the entire course- there were still cars that were driving quite fast and close to the orange cones blocking our running lane. While we were running through some of the intersections, you could hear motorists honking and cursing at the police who were holding them back. It kind of put a damper on the race. Pace for this section was 11:42- 12:09. 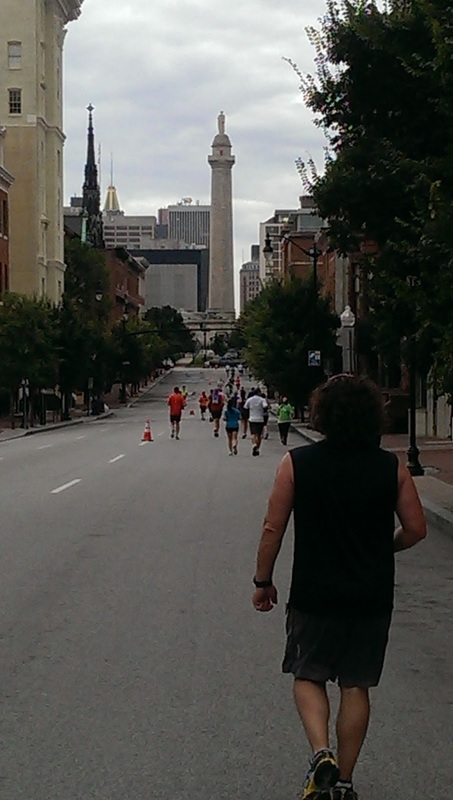 One cool part of this race was running around the Washington Monument- pretty awesome. 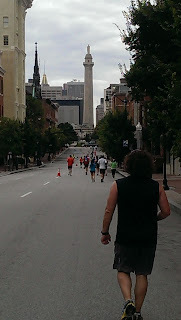 After running the last few miles through downtown Baltimore, we rounded the corner towards Power Plant Live and the finish line. Official finish time- 2:31:57, 12:40 average pace. I'll take it. After we got our medals, we picked up our free beer and food and sat down to enjoy the finish line band. I also had to switch out my premium- they allowed you to switch sizes at the end of the race- the XL I ordered ended up being way too big but I was able to trade in for a smaller size. I'd give this race a 6/10. The course was beautiful, enjoyable, and well-stocked with water stations. The premium and medal were really nice and the post-race party was easily-accessible and fun. However, there were not nearly enough bathrooms on the course and being so close to the traffic was anxiety-provoking. There also was ZERO crowd support. Because this is a brand new race, I think a lot of these issues will be straightened out for the next one.